Bill graduated from drama school in the late 70’s, and quickly created the Kirribilli Pub Theatre, a subversive incubator for renegade comedy, that excited and terrified Sydney. It was here in 1983 that he linked up with stand up comic and VO legend Jim Pike who introduced him to the world of…VOICEOVER! Bill quickly became the voice of beer giant Tooheys. His ‘How d’ya feel’ campaign became the most successful radio campaign of the time, scooping up innumerable awards and generating substantial sales for the amber product. Other brands quickly recognised the unique selling power of Bill’s ‘beer voice’ and he can confidently say he has voiced the vast majority of Australia’s ales/lites/full strengths/olds/news/pilseners to great success. Even Peroni couldn’t resist his dulcet tones! Bill has perfected the ‘natural read’ and has the envious ability of turning what could be hard sell, sometimes abrasive copy into relaxed, over-the-back-fence conversation which entertains and sells. As well, having trained as an actor, he works well in an ensemble, bouncing off other voice artists in the studio to create visual scenes in an audio format. Bill is easy to work with and contributes creatively in the process. On many occasions his subtle contributions have been integral to the success of the commercial. He has worked for all the major agencies and radio stations and voiced many highly successful campaigns including the RTA (A message from the RTA), government and political advertising, Chemistworks, and recently is voicing the national Colourbond Roofing television campaign. On top of that he is also one of the regular voices on the ABC’s Media Watch programme, as well as being a regular contributor to Radio National’s radio plays. Documentary, corporate and training film narration is another string to his impressive range of skills, and his narration of the documentary A Very Short War is a great example of his work. He is one of Australia’s most experienced character actors with over 20 feature films under his belt (The Great Gatsby, Superman Returns, Japanese Story, Chopper, The Matrix, The Road to Nhill), a wealth of television experience, and an impressive array of theatre credits. On top of this he works as a director in film and documentary (The Roly Poly Man, A Very Short War), television and theatre. 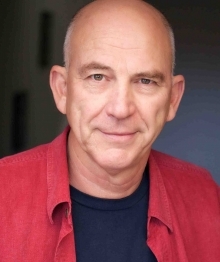 Bill has been a member of the MEAA (Actors Equity) since 1975 and is a committee member and treasurer of the Actors Benevolent Fund of NSW Inc.. I have had the distinct pleasure of working with Bill for over 25 years. Every session without fail, Bill has delivered well above the bar! He takes and responds immediately to direction, he has a sense of timing that would make any fellow musician or comedian envious, his characters and reads are believable,heart felt, real, and above all he enhances a session with his humour and his ability to draw from his deep well of experience. What else can I say but that Bill is a talented and great bloke to work with! Bill ticks a lot of boxes (and can probably carry a few too). He brings authenticity to every role whether it’s a four word announcer endline or a cheeky bit of dialogue. One of my first jobs with Bill left me laughing so hard I almost forgot to press the record button. I’ve done dozens of recording sessions with him since and he’s delivered every time. Whether he’s the bloke next door, the tradie, the authentic brand voice, the corporate narrator or an assortment of characters, Bill brings talent and experience to every job. And as a director himself, he’s a master at taking notes and reading the room. It’s always a pleasure working with Bill and I’m looking forward to the next project. It’s hard to know what to say about Bill Young. He’s an actor, a voice artist, a film director and a documentary maker. His years in stand-up comedy inform his innate sense of timing, & his wide range of voices can fill any brief. I have worked with Bill the voice artist for many years as well as Bill the director & it’s always easy. With Bill, you’re in a safe, if rather large, set of hands.